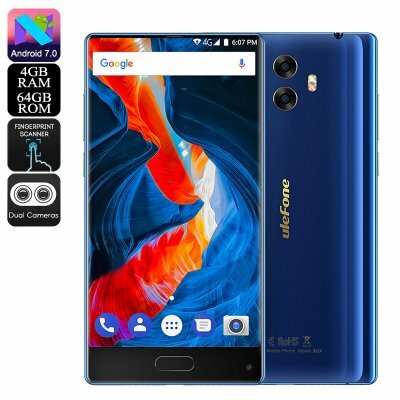 Successfully Added HK Warehouse Ulefone MIX Android Phone - Bezel-Less, 13MP Dual-Rear Camera, Android 7.0, Dual-IMEI, 4G, 4GB RAM (Blue) to your Shopping Cart. Enjoy the latest features the smartphone industry has to offer at an affordable price with the Ulefone MIX Android phone. This cheap smartphone runs on an Android 7.0 operating system and comes with sophisticated hardware. Therefore, it is capable of tackling demanding Apps and software alike. If you’re into mobile media, this Android phone is perfect for you. Not only is it capable of delivering a smooth user experience, it also comes with a stunning 5.5-Inch Bezel-Less display. This edge-to-edge Full-HD display treats you to an unlimited visual experience in crisp 1080p resolutions. The Ulefone MIX Android phone packs a whopping 3300mAh battery for 5 hours of continuous usage time. Additionally, this cell supports a stunning 100 hours of standby time. With this smartphone at your side, you’ll be able to get through multiple days of regular phone usage without needing to recharge. To makes sure that you’ll be able to enjoy all your favorite media, this Android phone supports 64GB ROM. In case that’s not enough, it lets you slide in a 256GB SD card. This should provide you with all the memory needed to store your files, games, and media that can now be enjoyed on the go no matter where you’re at. With its professional-grade 13MP Dual-Rear camera, this Android phone lets you shoot absolutely stunning pictures and 1080p video at any given moment. Your phone furthermore comes with an 8MP front snapper that lets you engage in FHD video calls. With its Dual-IMEI numbers and 4G support, this Android smartphone makes sure that you’ll always stay connected. Whether you’re at home, the office, or out in the park – with the Ulefone Mix you’ll always stay within reach. The Ulefone MIX Android Smartphone comes with a 12 months warranty, brought to you by the leader in electronic devices as well as wholesale Android phones..